Welcome to Museo Lumad: Land, Culture, Life. 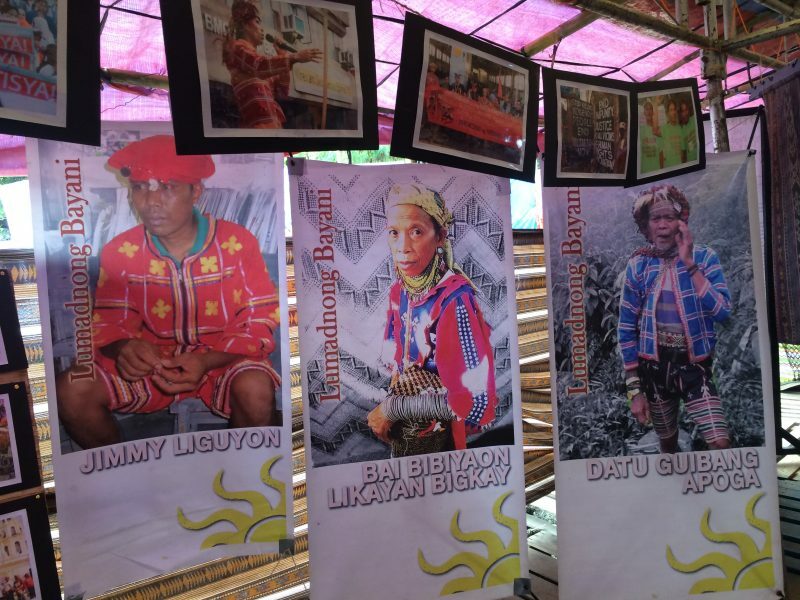 The Lumad indigenous peoples of the southern Philippine island of Mindanao have set up a museum inside a protest camp in the capital, Manila, to highlight their culture and their continuing struggles against displacement caused by the plunder, land grabbing, and militarization of their ancestral lands. 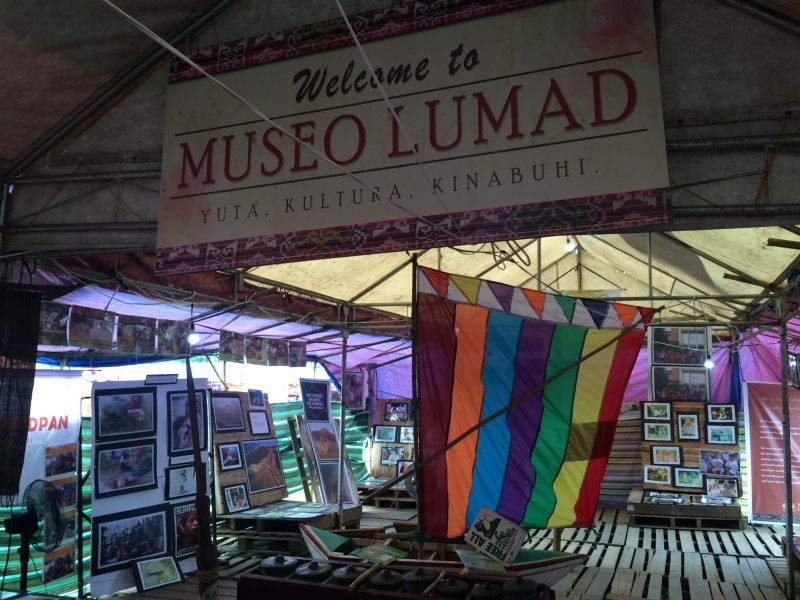 Dubbed the “Museo Lumad”, the museum was part of the “Lakbayan ng Pambansang Minorya” (Caravan of National Minorities) that saw some 3,000 Lumad, Moro, and other national minorities from all over the country travel all the way to the capital to bring attention to their issues. A big protest in front of the US Embassy by the same groups of national minorities ended in violence on October 19, 2016. Police brutally dispersed the rally using teargas, truncheons, and a police van that rammed and ran over the protesters. 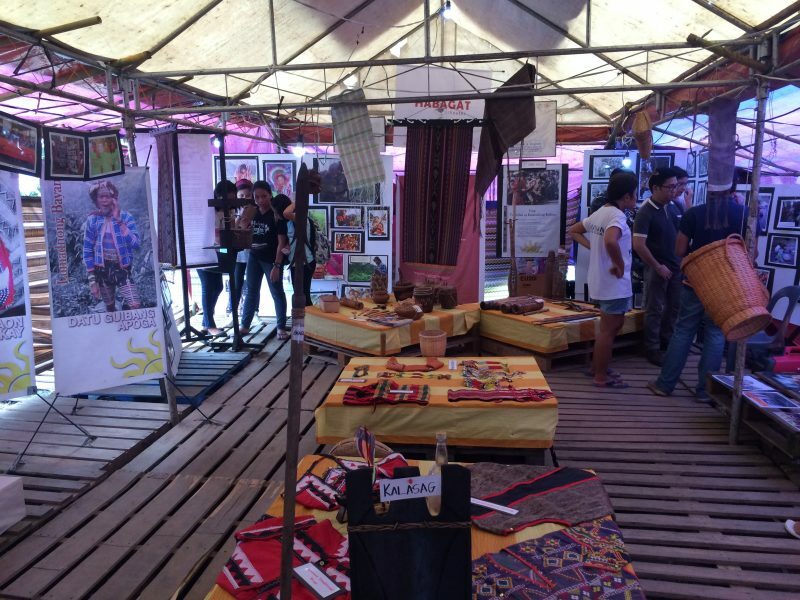 University students and other visitors from Manila take a look inside Museo Lumad. 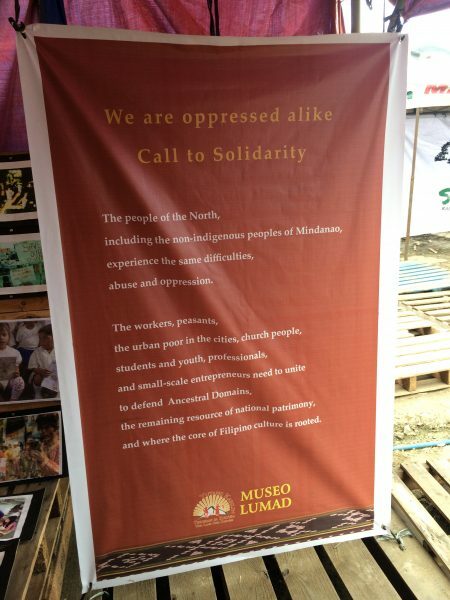 Museo Lumad was initiated and conceptualized by “Kalumaran”, an alliance of Lumad minorities founded in 2006, which continues to manage the space with the help of rights advocates and support groups. 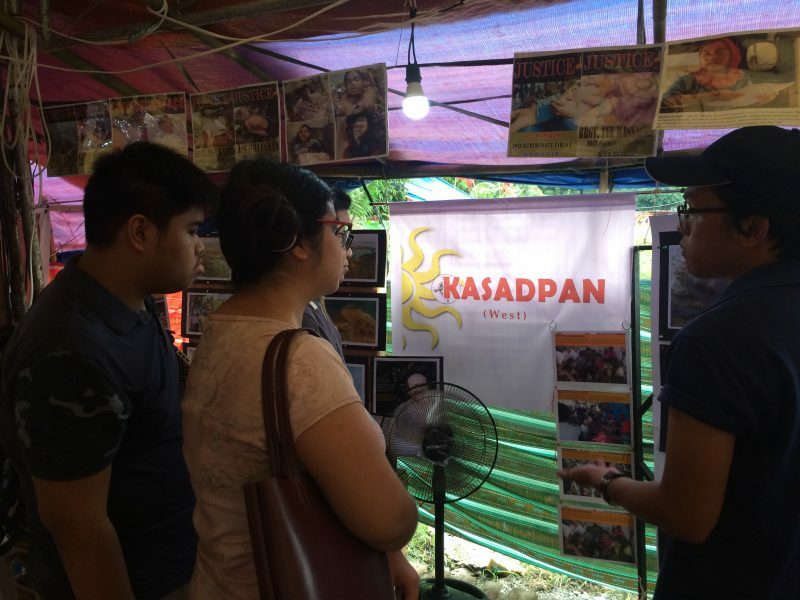 The museum was assembled on the campsite for the national minorities, which was hosted by the University of the Philippines Diliman in Quezon City for two weeks between October 14 and 28, 2016. Reminders for visitors before entering the museum. Before entering the museum, visitors are reminded, among other things, to be respectful, view the exhibits in reverent silence and refrain from touching the displays. Patrons are also encouraged to participate in a post-tour discussion, in order to deepen their appreciation of the culture and struggles of the country's national minorities. Inside, the exhibits are arranged according to different themes that follow the four cardinal points, identified in the vernacular: “Amihan” (North), “Habagatan” (South), “Sidlakan” (East) and “Kasadpan” (West). We are the peoples of the South. The south is our home, with lands formerly fertile and wide, the forests green, with pristine rivers and streams, and the people living in peace and abundance. 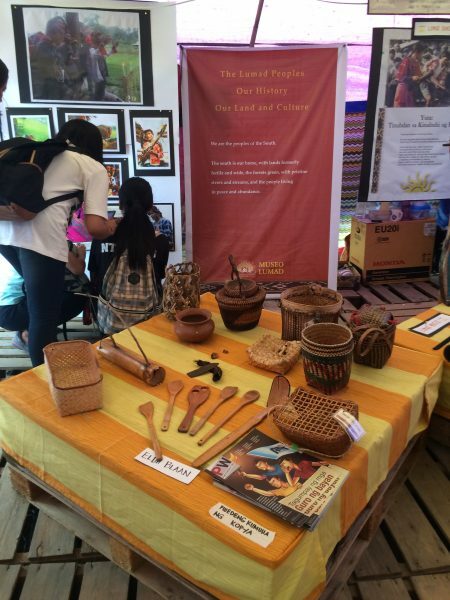 Artifacts like assorted utensils and baskets are part of the exhibit on Lumad history, land, and culture. 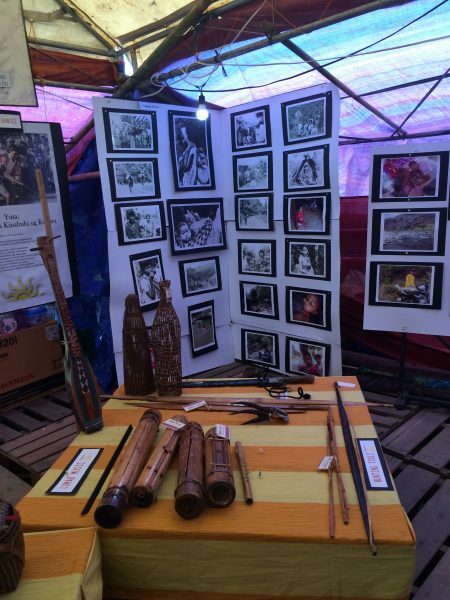 Lumad musical instruments and other artifacts are displayed alongside photos of their way life. The sun sets on our ancestral lands. Ancestral domains have now become ‘residual lands.’ The monopoly and usurpation of the lands, especially by multinational corporations and government projects, plague our peoples. These are accompanied by the militarization of our communities. University students discuss issues confronting the Lumad national minorities such as the plunder of ancestral lands and militarization. 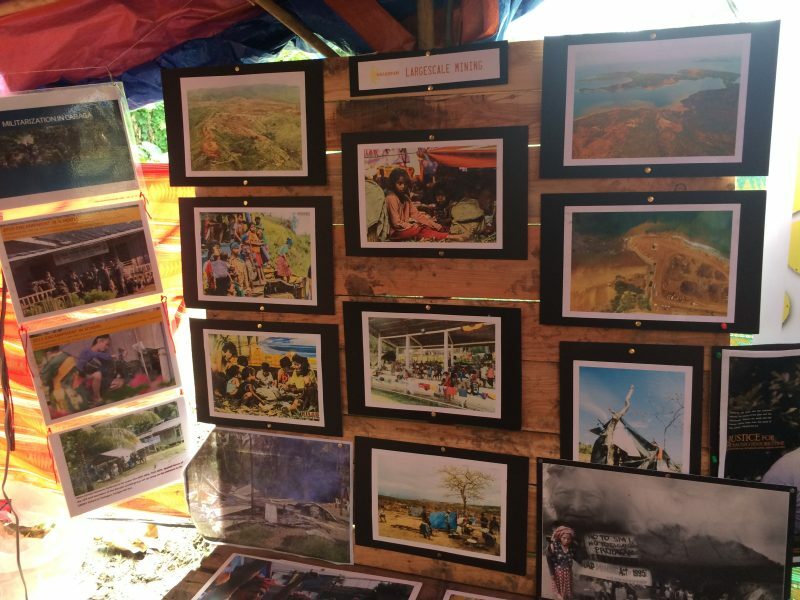 Photos showing the destruction caused by large-scale mining and its effects on Lumad communities. 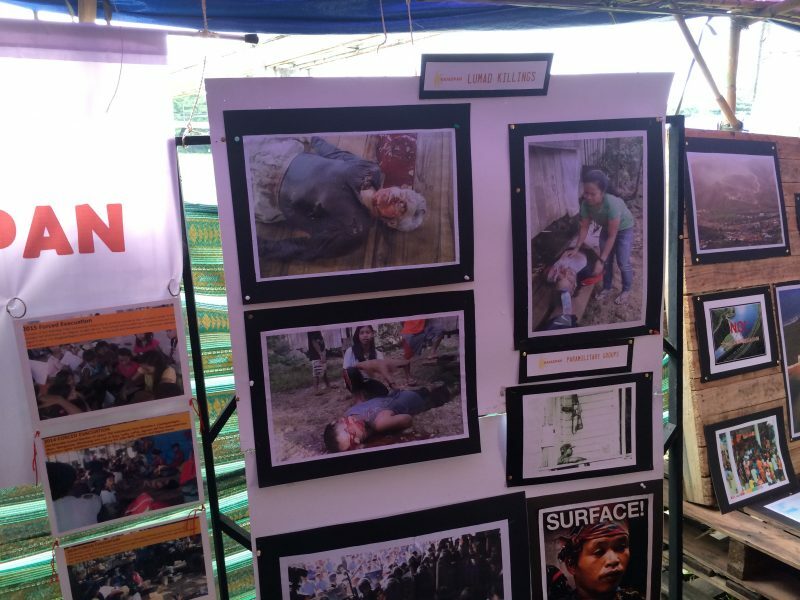 Photos of Lumad victims of extrajudicial killings and enforced disappearances perpetrated by alleged military and paramilitary forces. We look to the East because there is hope. With our unity of strength and action as Lumad, we will defend our Ancestral Domains, and enrich our culture and identity. 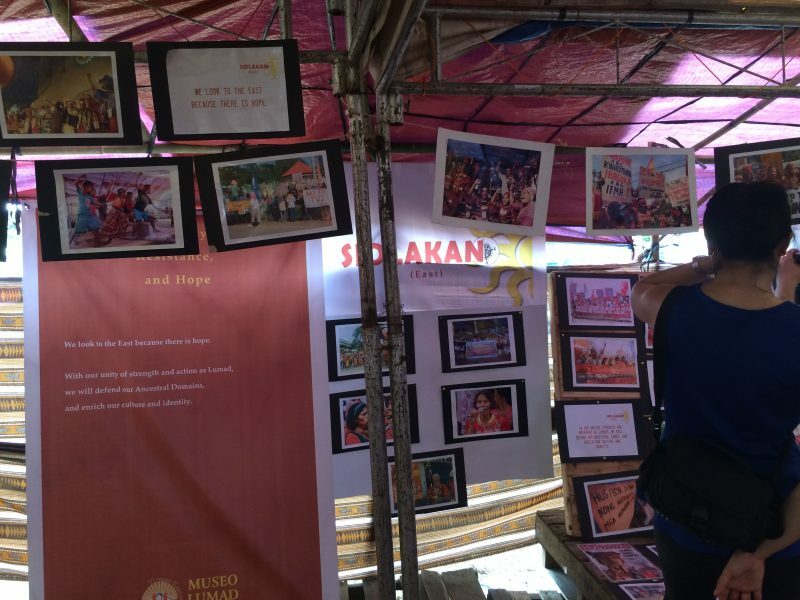 Sidlakan: the eastern portion of the exhibit highlights the unity, resistance, and hope of the Lumad. Bukidnon Lumad leader Jimmy Liguyon (left) was killed by alleged paramilitary groups when he refused to sign an ancestral land certificate that would allow the entry of big mining investors. Bai Likayan Bigkay (center), a woman Lumad chieftain from Bukidnon, and Datu Guibang Apoga (right) of a Lumad community in Mount Apo, continue the struggle to defend their land and rights. The people of the North, including the non-indigenous peoples of Mindanao, experience the same difficulties, abuse and oppression. The workers, peasants, the urban poor in the cities, church people, students and youth, professionals, and small-scale entrepreneurs need to unite to defend Ancestral Domains, the remaining resource of national patrimony, and where the core of Filipino culture is rooted. 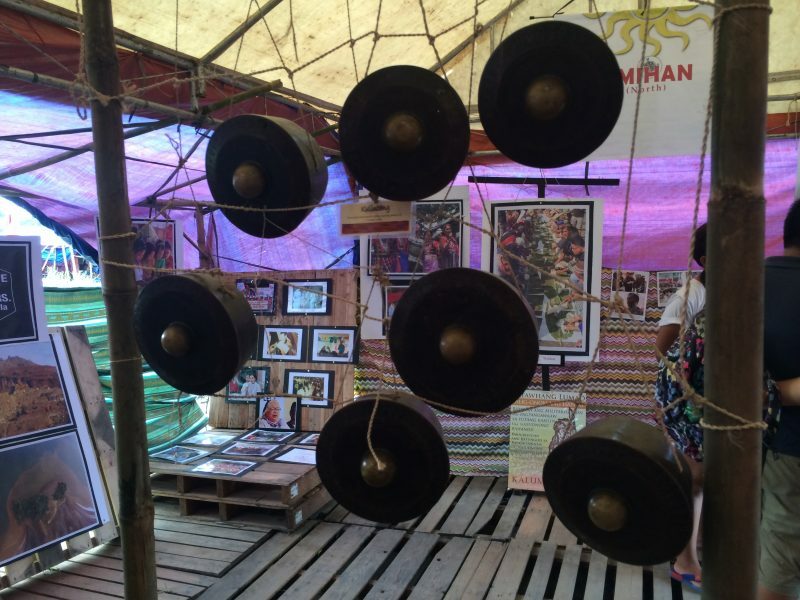 The kulintang musical instrument and behind it the exhibit on solidarity with the Lumad. A call for solidarity to the Lumad and other national minorities. This Museum is unlike modern or academic museums that tend to treat indigenous images and things merely as pretty relics for display, with no relevance towards strengthening our social movement for indigenous peoples’ rights. 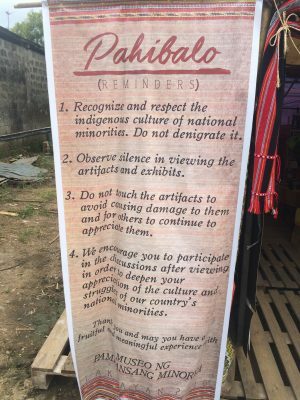 This Museum is divergent from the colonial and neocolonial view of indigenous peoples that perpetuate institutionalized discrimination and denigrate national minorities as a people belonging to a civilization that is ‘inferior’, ‘backward’, or that has passed. All photos are by the author of this post, used with permission.